M2 Performance Nutrition was founded with the goal of helping people reaching their athletic potential. Through our experience working with some of the fittest people on the planet, we noticed that despite tremendous efforts, many people were still struggling. We want to fix that. We've worked with everyone from weekend warriors to Crossfit Games Champions, ages 16 to 60+ years old, and from all different walks of life. If you want to perform your best, its time to take ownership of your nutrition. Whether your goal is to lose weight, build a healthier body or compete at the highest level, you have to match your intake to your exercise out put for long term success. I’ve always had a natural interest in learning how to cultivate health and performance in this crazy world we live in. Over the course of my career, I've studied regenerative muscle biology, biochemistry and I completed my PhD in Immunology & Micriobiology. This career path has given me a unique perspective on health/nutrition and how to improve both for performance. Since 2008, I've been working with people on optimizing their nutrition and lifestyles for maximal performance. Most recently, I've focused on the Crossfit community, and in 2017 I'll have 10 athletes competing at the Crossfit Games in Madison, WI. It has been an incredibly rewarding experience to see people take control of their lives. I have always taken a special interest in performance nutrition throughout my studies, due primarily to my background in competitive athletics. A Registered Dietitian Nutritionist by trade, I have my license through the Academy of Nutrition and Dietetics, as well as both a Bachelors and Master’s degree in dietetics from Eastern Illinois University. I have always taken a special interest in performance nutrition throughout my studies, due primarily to my background in competitive athletics. I take a personal interest in the science behind using food as fuel to perform while helping people change their bodies. In addition to working with many athletes, I myself love to compete. In 2016, I went to the Crossfit Games on Team OC3 Black, taking 5th place overall. In 2017, I've been competing as an individual and finished third in the Atlantic Regional, punching my ticket to the 2017 Crossfit Games in Madison, WI. With a bachelors in Exercise Science and multiple certifications in Nutrition, I bring a unique perspective to coaching that reflects my eduction, but also first hand knowledge of what its like to struggle with making the right decisions for my goals. I have taken serious interest in helping people make positive changes in their lives whether it’s for performance, health, or longevity. It has been extremely rewarding and motivating. My love for coaching is driven by the incredible feeling of seeing the success of my athletes, creating lasting relationship, and being able to share my knowledge. In fact, I personally struggled with nutrition based on misguided attempts to "eat less and burn more." Luckily I was exposed to an alternative path that allowed me to have more food, more energy, a clearer mindset that ultimately led to better performance. In addition to being a Nutrition Coach, I love to compete. I have an elite athletic background as a former Division l Athlete (field hockey) and CrossFit has given me a chance to continue challenging myself daily. I’ve dedicated the past 5 years of my life to working with individuals within the CrossFit community to help improve their performance with in the gym and the quality of their lives outside of the gym. I was very active from early on. A 3 sport athlete in high school, I passed on a soccer scholarship to pursue an childhood passion of mine, dance. What I found at dance school was not a love of the art but a love of the human body and movement. The athleticism of dance blew me away. After college I pursued a personal training certification which eventually led me to the CrossFit community. CrossFit was a place where I didn’t feel shame about my big strong legs, CrossFit was the first place where they were coveted and celebrated. The weight I could lift was more important than the size of the pants that covered them. Shortly after joining CrossFit as a member, I became a coach. Although the community of CrossFit welcomed my body and its athleticsim, I still struggled with my self image and the food it took to fuel. As someone who struggled with their weight and body image their whole life, I tried every fad diet under the sun. After years of struggling with my relationship with food, I found macro tracking. It seemed too simple to be real. Just eat real food, that you enjoy, in the right quantities, and you can reach and maintain your ideal body weight and performance. No tricks or gimmicks?! Initially I was skeptical, and overwhelmed by the amount of food I “needed to eat”. I had spent years trying to eat less than 1500 cals a day and as it turns out as a 5’9” athletic woman who has a substantial amount of muscle mass, this amount of food was laughable. I was hungry and irritable when I was “ON” my diet and when I was “OFF” I would binge on the foods I deemed bad or off limits. Macro tracking completely re-wired my thinking away from good vs bad foods, to just food that my body needed to stay healthy & strong. Soon I was eating upwards of 2000 calories a day and losing weight!!! It blew my mind. All around me so many of my clients were doing all of the “right things” in the gym and not seeing the results that they wanted because of their diet. Most of them were under eating or holding on to old diet trends they had picked up over the years, preventing them from losing weight and reaching their performance goals. I wanted to help them! I wanted them to know what I knew and to have the true freedom to eat the food they needed to fuel their life. I decided to get certified as a nutrition coach so that I could help others change not only their way of eating but the way they felt about the food that they were eating. With a background in psychology and counseling, I have been able to directly apply these practices to working with clients and ultimately help them achieve their fitness/nutritional goals. In order to successfully change to a healthy lifestyle, we must make positive behavior modifications and learn how to successfully stick with them. Growing up on a farm with 3 older brothers, I had no other choice but to live an active lifestyle. From an early age I started playing basketball, volleyball, soccer, and ran track. While I enjoyed playing all sports, by the time I was ready to head off to college, my body was exhausted from being continually mal-nourished. While I still played intramural sports and worked as a personal trainer, I realized the importance of learning more about nutrient dense food and how to accurately supply my body with enough. While I have worked in a variety of different career paths, I have found the most success in helping others through coaching proper fitness and nutrition. I have committed 5 + years in the service industry which included, working within a nursing home, counseling at risk youth and their families, to now working as a CrossFit and nutrition coach. This past experience has taught me how to assist an individual in overcoming food addiction / negative feelings towards food, and help people understand how to view food as a fuel source and in a positive light. I truly believe that the best medicine is through activity and nutrient dense foods. For the past two years, I have worked with clients to help them obtain their goals and building a mentality that food isn't always going to be a struggle, but one that requires a little coaching. By focusing on performance and energy levels, while prioritizing sleep and mental wellness, I have truly enjoyed helping clients move past an all or nothing mindset by teaching them how to use food to fuel their bodies and minds. All my life I played soccer year-round, even playing through college, but as that chapter of my life ended I felt I lost that feeling of competition and community. About seven years ago, I was introduced to crossfit, which gave me a new set of goals and the added push from my fellow gym members. The void I felt when soccer ended was filled with crossfit, bringing new friends and a new outlook on fitness and nutrition. I took an interest in the paleo diet as recommended by one of my crossfit coaches, initially as a way to look better, but also loved the idea that the quality and type of food one eats can directly affect how you feel, perform and your overall health. Despite my love for athletics, this was the first time I had been exposed to this type of thinking. For a few years, I went back and forth trying to be strict paleo, only to find myself eventually falling off the wagon. I would feel guilty, or like I had a lack of will power when I fell off the paleo diet by eating a piece of bread at dinner or that tempting cookie during the holidays. I flip flopped between paleo and a strict caloric deficit diet, but still couldn’t stop feeling guilty about food, nor could I drop the weight. I developed an all or nothing mentality. If I had one “cheat meal” the whole day was ruined in my mind, and I would eat everything bad I could find, promising myself I’d be “perfect” tomorrow. After a few years of this cycle, I found flexible dieting and it changed my relationship with food. Throughout my career I have spent time in many facets of the fitness industry, from personal training, to coaching both strength and conditioning and CrossFit. Working as a nutrition coach has been the thing which continues to excite me and fulfill me beyond measure, and I believe this field is where I will make the greatest impact. From the time I was a little girl, growing up on the island of Maui, I have always been fascinated with how to become better, faster, and stronger. While I was competitive in surfing, soccer, and water polo there was definitely a missing link in my nutrition. It wasn't until I was in college, working toward my degree in exercise science, that I realized the measurable impact nutrition has on performance, along with the competitive edge it can provide. I immediately became grossly aware and equally frustrated with the lack of understanding most (including myself) had on the topic. That realization sparked an overwhelming desire to learn as much as possible with hopes to further and share my understanding with others. I began to educate myself on the impact dietary practises have on our physical performance as well as our mental and emotional health. This passion has only grown as time has passed and I plan to continue my education though the Nutritional Therapy Association this Spring. Throughout my career I have spent time in many facets of the fitness industry, from personal training, to coaching both strength and conditioning and CrossFit. Working as a nutrition coach has been the thing which continues to excite me and fulfill me beyond measure, and I believe this field is where I will make the greatest impact. My journey with nutrition began when I was in high school- I was a quick fix, yo-yo dieting, binge eating queen. I was born with a body I couldn’t understand or appreciate, and I didn’t consider the things I was capable of because I was blind to the reality that I had worth. This is when I became obsessed with the idea that having a healthy relationship with food would be my platform for having a healthy relationship with myself. So, I began spending my time reading. A lot. Educating myself and learning from others- hour after hour. I started attending Certifications and Specialty Courses to fine tune my trade. I began taking on my formal clients soon after and worked tirelessly to become a sharper, smarter, and more educated coach. I was seeing incredible success and growth in both my clients, and myself. In time I realized that my heart was in one place; helping others discover their own ability to achieve the things that are most important to them. Because of my history with food and my own commitment to the sport of Crossfit, I bring a unique trait to the table. I can sit down with clients who are rooted in their competitive sport, OR clients that are holding onto monsters of the past and let each of them know- I have been there. If I get the opportunity to empower others in living a better life, I have undoubtedly made my impact. Sharing nutrition knowledge and habits to help people achieve their goals is my passion. As both a coach and athlete, I understand the challenges of setting and meeting your fitness goals. I want to help break through those barriers to create healthy patterns and a better quality of life. I grew up playing all kinds of sports ranging from soccer to cheerleading. My love for being active only grew throughout high school and college where I played soccer and ran track. Keeping up with an active schedule while caring for my health was the reason I started learning about performance nutrition. Competing and coaching in CrossFit years later emphasized this need even more. During that time, I also worked in the investment banking industry and learned how to use fitness and nutrition to maintain a better quality of life. Through my experience I’ve found short term fixes rarely worked. The best results come from thoughtfully integrating nutrition into a balanced lifestyle. My goal as a coach is to do just that; help you find a sustainable nutrition plan that best suits your needs. I have been an athlete my entire life, playing four sports in high school, with a focus on basketball leading to a full ride scholarship to play Women’s collegiate basketball. My journey in the fitness industry started in 2011, after graduating college, when I was introduced to CrossFit, leading to a career focused on helping people to succeed with whatever goals they have. I have ALWAYS had a niche for helping people, especially through fitness. In college, I was the crazy teammate pushing our team in practice to make sure we were prepared for the upcoming season. Through experiences both as an athlete and a coach, it became extremely apparent that a true “win” in my book was capturing the opportunity to make a positive impact on peoples lives. Today, I live in northern Kentucky where I am a nutrition coach and personal trainer. Through both a professional education in nutrition and some trial and error on myself, I’ve learned what works and what doesn’t. Much like many of our clients, I remember days of thinking 100 calorie snack packs were the way to go. Since then, I've learned that matching the effort we put in the gym with the effort we put into our nutrition and sleep is critical. I've been applying this philosophy with M2 since 2017 and love every second of getting to help people succeed both in the gym and in life. In 2006, I decided to serve my country in the Marine Corps. After 8 years I was forced into retirement due to a combat injuries sustained while deployed. Suffering from a traumatic brain injury and multiple physical injuries my doctors told me I would never be able to lift weights or maintain the endurance and fitness lifestyle I once had. I was on 15 different medications and gained over 50 pounds. I was bound and determined to prove the doctor wrong. I found CrossFit, which saved my life, and helped me return to an active lifestyle, even becoming a competitive CrossFitter. But it wasn't until I found that proper nutrition that my body truly started to heal. I was able to drop down to taking only 2 medications, lost the excess weight and I found my true passion in life! Serving as a Nutrition Coach I have been helping individuals achieve their athletic and ascetic goals by optimizing their nutrition and lifestyle. Also, as a male that has gone through body image issues and depression I have walked the walk and know what it takes to get through these challenges and achieve your goals. The power is within every person to create a disciplined plan for achieving personal health at the highest level. With a background in biochemistry, sports exercise, and a passion for nutrition and performance, I believe in a scientific approach of standards and realistic goals where positive measurable personal results foster a greater enthusiasm for continued success. I started to take a more personal interest in nutrition when I was in college. I read books, articles, talked to everyone and anyone I could to gain and further my perspective. It seemed that every conversation I was having was about food! It was not until a few years later that I really started to understand and appreciate what my body was capable of. I became obsessed with the feeling and empowerment of having a healthy relationship with myself. I have always had an interest in nutrition and have been an athlete my whole life, competing in swimming & long-distance running, yet still found myself battling with eating disorders growing up. 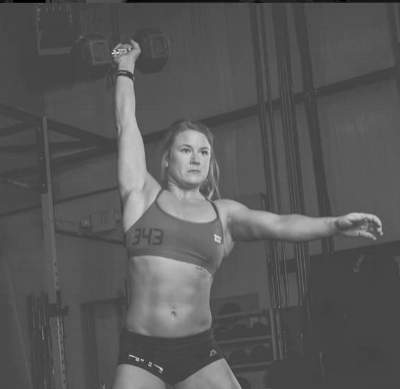 Ultimately, through CrossFit and more education, I was able to overcome those patterns, and love my body for what it is capable of and not how it looks. I now use my diverse athletic background and first-hand experiences to help others understand how food is fuel and eating a balanced diet will help with performance and everyday living. I understand that everyone is unique and each person has different goals. A client's abilities, motivation and daily challenges are diverse, and I strive to account for all of them in order for each person to find success.